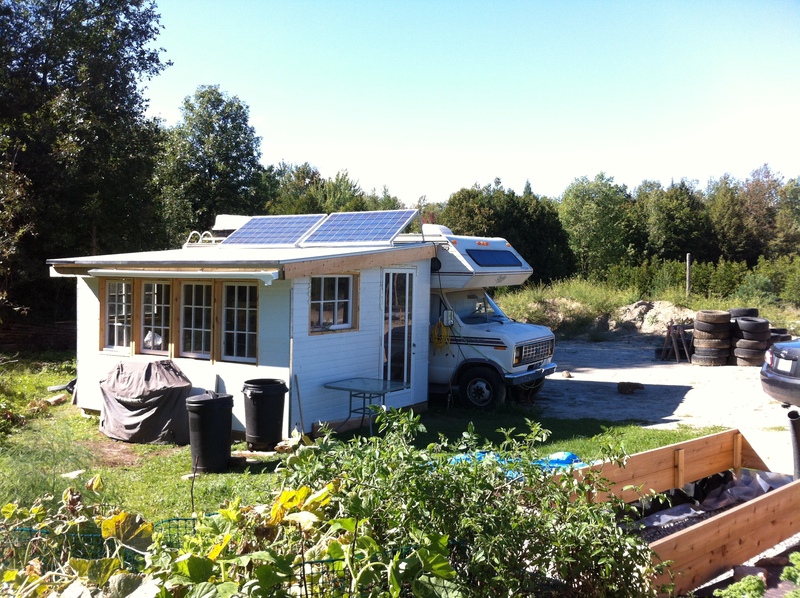 Welcome to our Earthship blog! 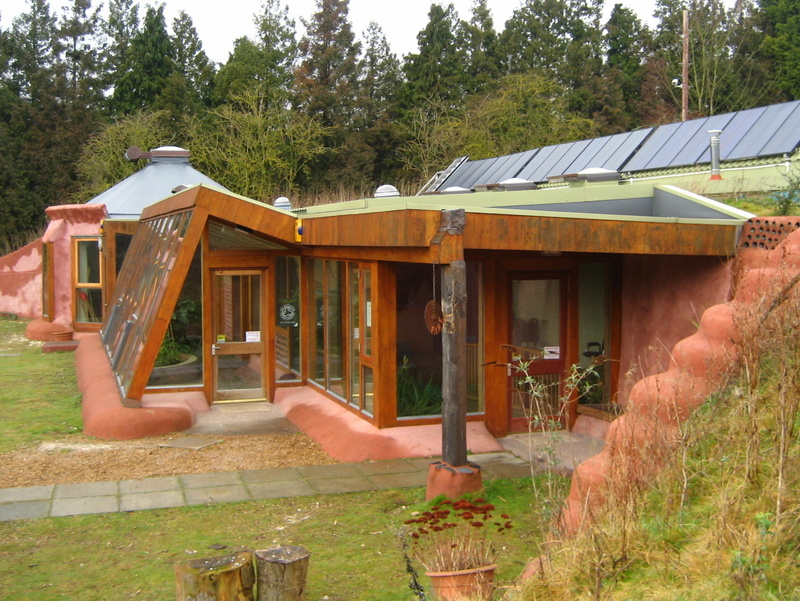 We first fell in love with the concept of the Earthship about 20 minutes into watching the Garbage Warrior in 2008. We paused the movie, looked at each other and said “We have to build one of these!”. And that was it, since that day we have been on a path to building our own. 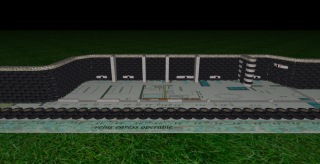 Finally an update to the blog! 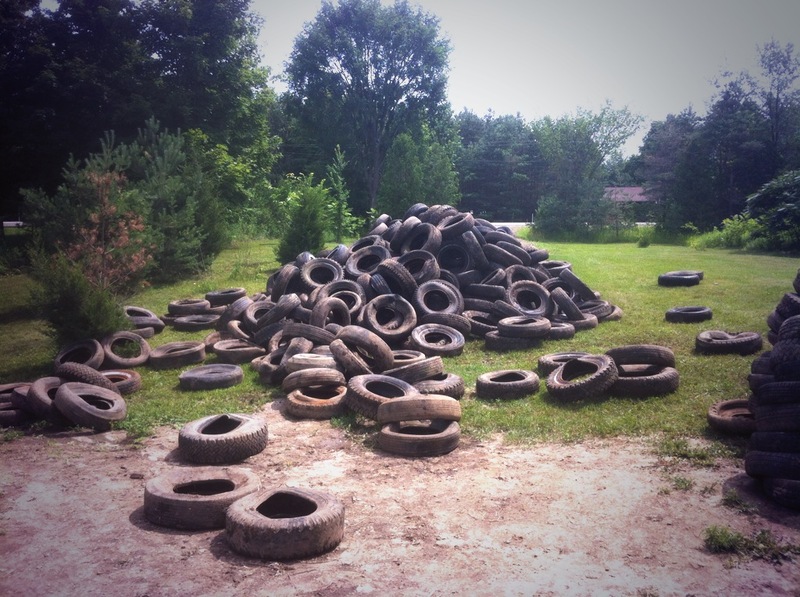 We had a very productive summer. 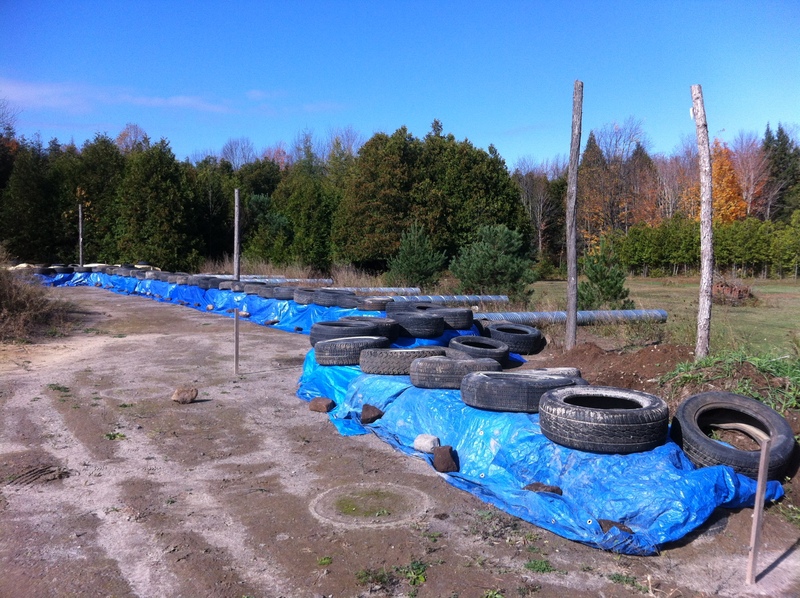 We managed to get all of our tires on site, two courses of tires completed, vent tubes in place, found a deal on solar panels, built an enclosed porch for our RV, added four more wicking bed gardens, built a compost and produced a bunch of our own vegetables (and a few fruits)! All in all, a good year for us. We are looking forward to getting started again this spring. 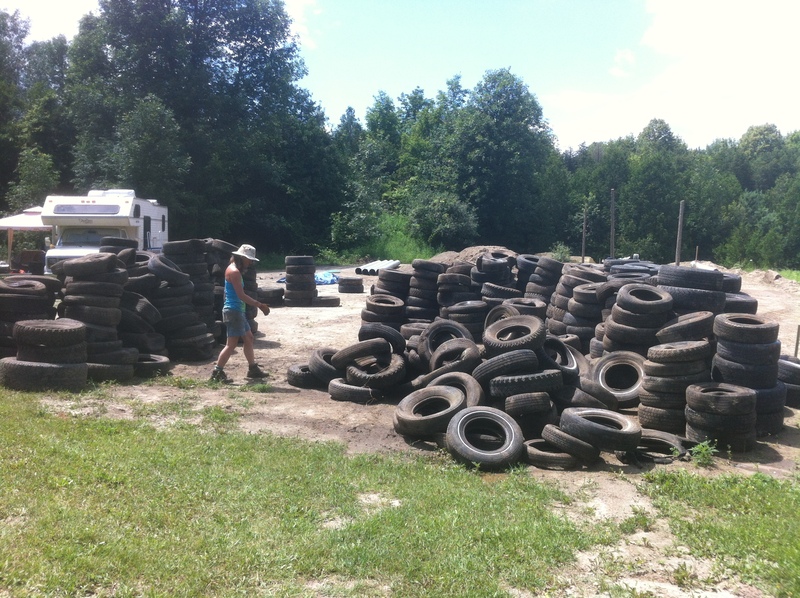 We will organize a few volunteer weekends through our new friends at Earthship Ottawa. 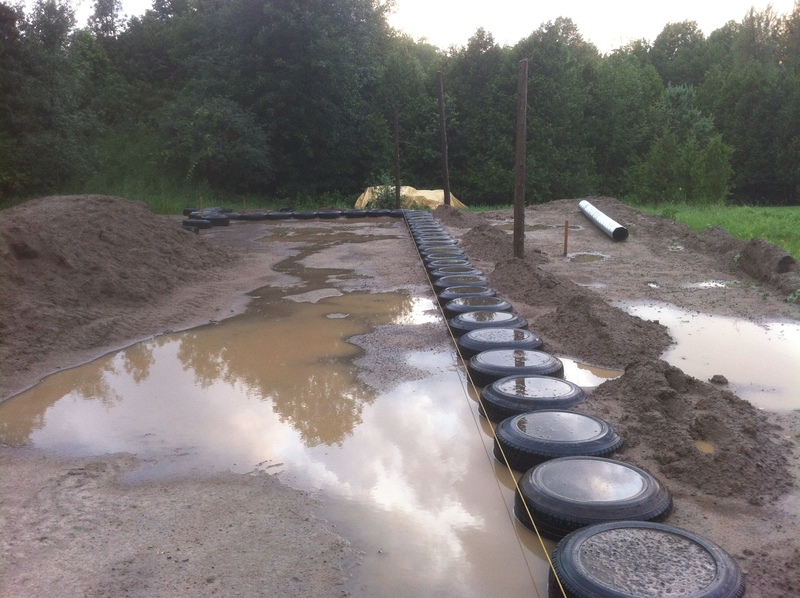 If you are interested in learning more about Earthships it’s a great group of people and always a fun get together. A small update to this post. 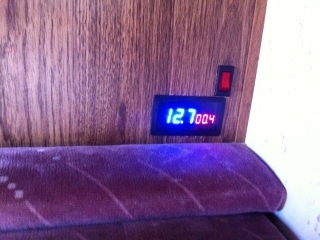 We ran across a great deal on solar panels and have upgraded the system for the RV. 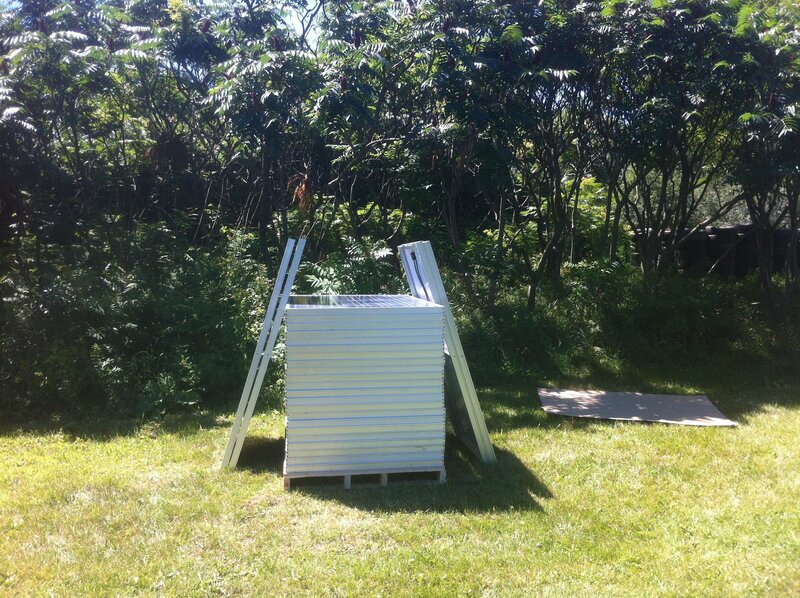 We picked up a pallet of 230 watt panels that were rejected on a large installation for minor visual flaws. 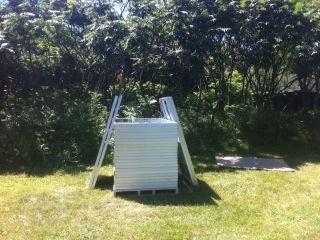 We tested each panel for voltage and current and each panel meets and usually exceeds the manufacturers specifications. Most are in storage until we need them but we kept 2 and added them to the RV system. Just 2 panels has increased our system by 8 times! This is a repeat of a tweet from last summer but I thought I would add it to the blog just the same! 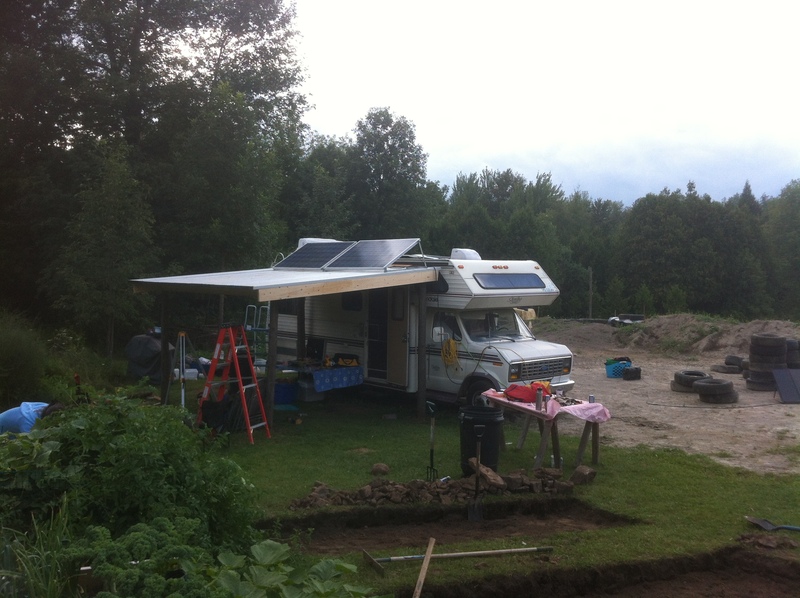 In an effort to get used to the idea of living offgrid and working with a solar system, we converted our construction trailer (a.k.a. RV) to a solar system and doubled the capacity. 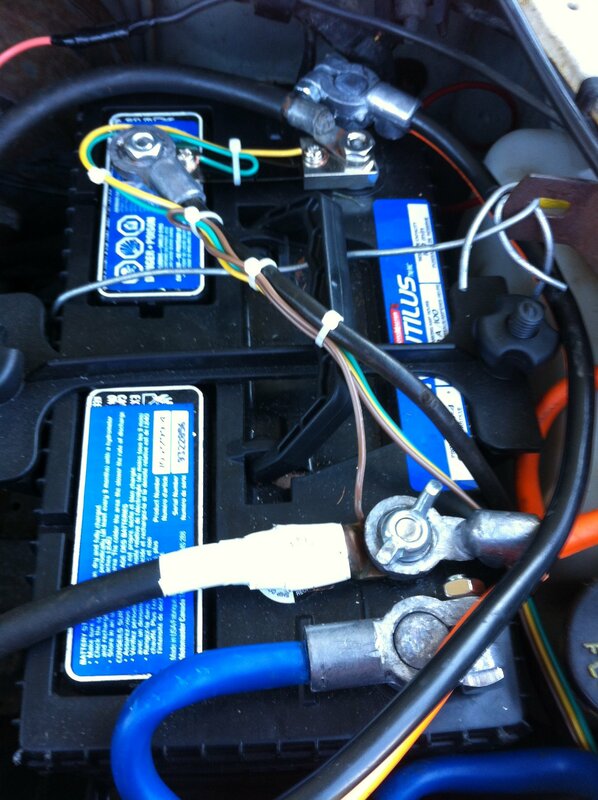 The images below show you the modification to the original battery system in the RV. 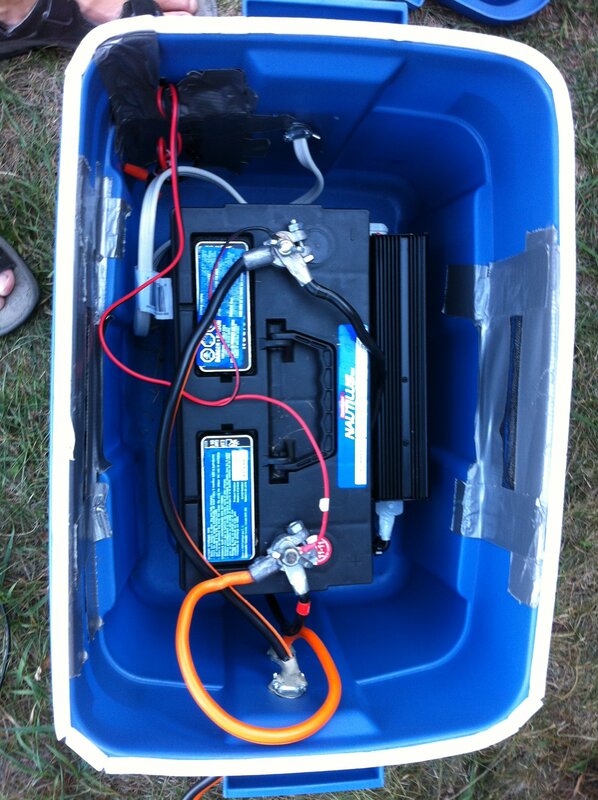 I replaced the original battery and added a second to bring the capacity up to about 180 amp/hours. 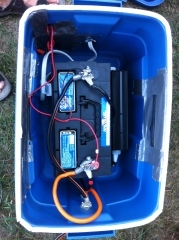 Using a Rubbermaid container I made a box to house the second battery and a power inverter. It sits under the RV itself and has a 110V power outlet. We use the outlet to run our hand vacuum cleaner, charge laptops, IPhones, power tools etc. I also changed every light in the camper from incandescent to LED. This reduced the lighting draw down to about a tenth of what it was with the incandescent bulbs. Overall the new system meets all of our needs for now but we may bump it up as we move ahead with construction. With deep cycle batteries it is recommended to always keep your batteries above 80%. This will maximize the life span of the batteries. This means that the batteries should never drop below 10.5 volts or so (max is around 13.2 volts). 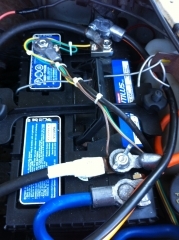 To help regulate this and avoid battery damage I also added a voltage/current meter to the system. This meter is proving very valuable in other ways as we can now see what each appliance or device is drawing and adjust what we use when to maximize our stored power. 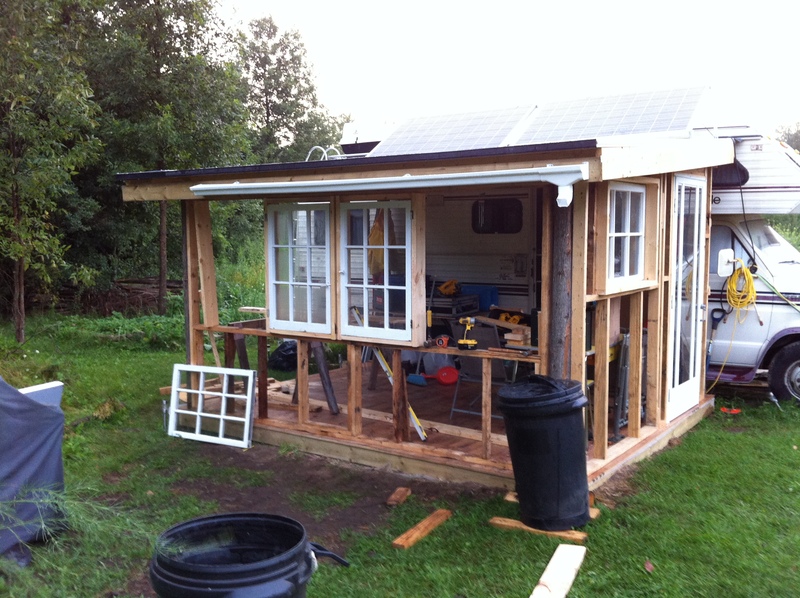 The batteries are charged by 3 small 25 watt solar panels. The panels are outputting 24 volts so we always have enough headroom to the charge controller to supply a consistent charge voltage even on overcast days. Since solar panels are not 100% efficient and the sun doesn’t always shine I calculate the solar panel output at about 75%. So with this in mind we can now refer to our meter to get an idea of how long we can run things. For example, if I run our vacuum cleaner for 1 hour straight I will pull 5 amps out of our battery system. This will take a little over 2 hours of sun to re-charge. Here is the math in case you’re interested (P=VA 75 watt panel at 75% is 56 watts divided by 24 volts is 2.33 amps per hour of charging if the sun is shining the entire time). So you can see it is easy to drain the system if you do not monitor it and manage your power use. The power usage adds up quickly when we are running a water pump, charging IPhones and laptops and running the electronics of our propane fridge. Two or three overcast days could be an issue. 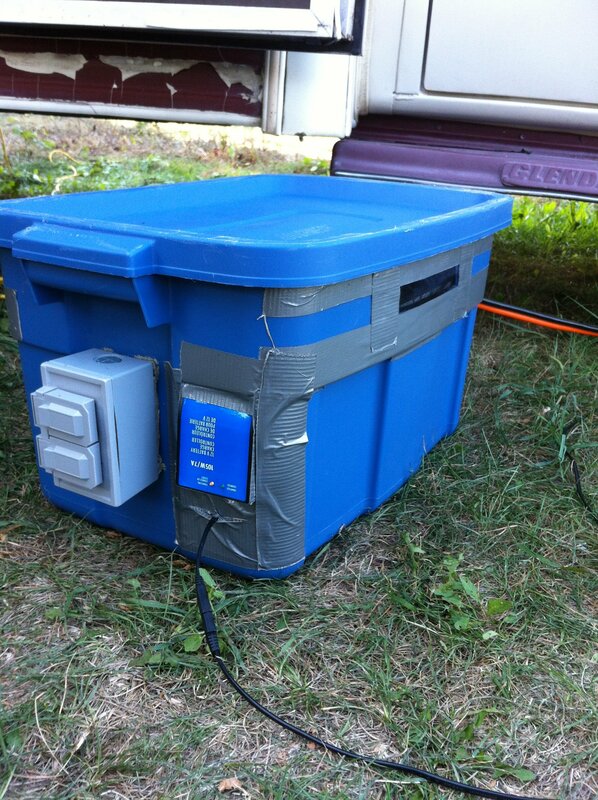 Luckily we also have a generator to quickly charge the system if we run into problems. Another option is to add more panels which we plan to do this year. I’ll try to add to this post when I upgrade the system some more. Feel free to add comments or ask questions using the comments section below the post. 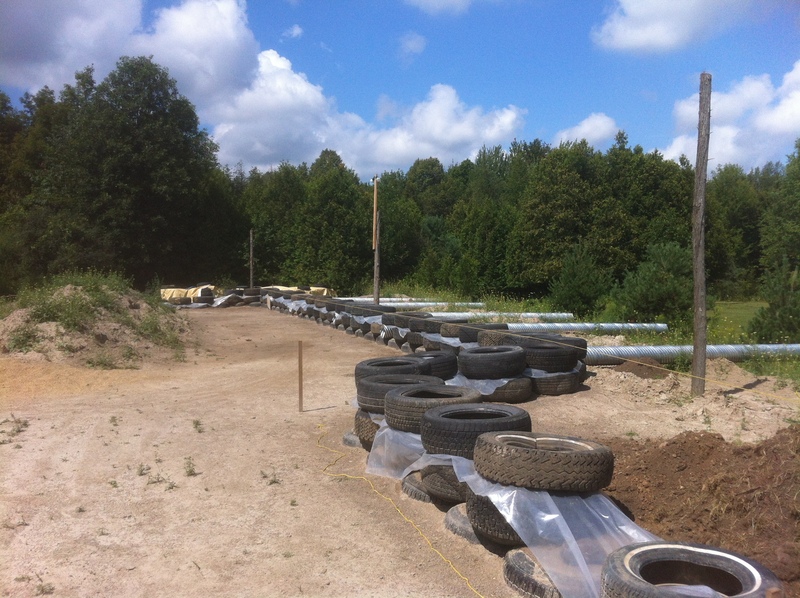 One of the challenges in laying out the first course of tires was trying to get the lengths of the back wall and wings walls to match the dimensions on our drawings. 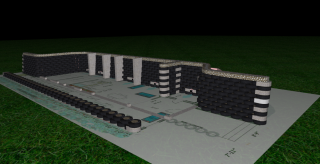 While this may not sound too difficult it turns out it is a bit tougher than you might think when you don’t have a member of the Biotecture team standing next to you! Firstly we should thank some very nice people at Morewood Tire who took the time to explain tire sizing to us (they also put us in touch with the right people to supply us with all of the tires we need, more about that in a future blog). This information taught us how to calculate overall tire diameter which we use when we need to make up a gap between tires in a row. 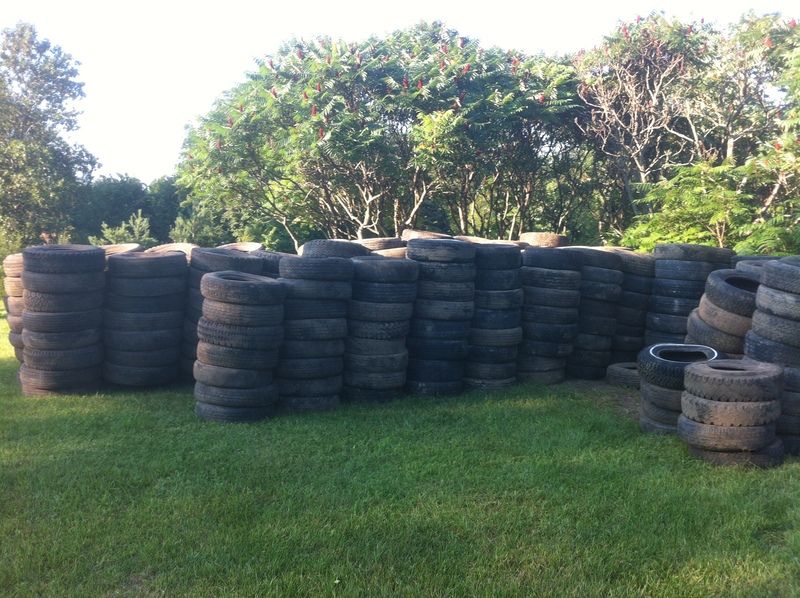 I even found a great WordPress plugin to create an online Tire Size Calculator. I found the tire sizing chart above on the web for reference. While this shows what each number or letter refers to it doesn’t give you all the information you need to figure out the full diameter. 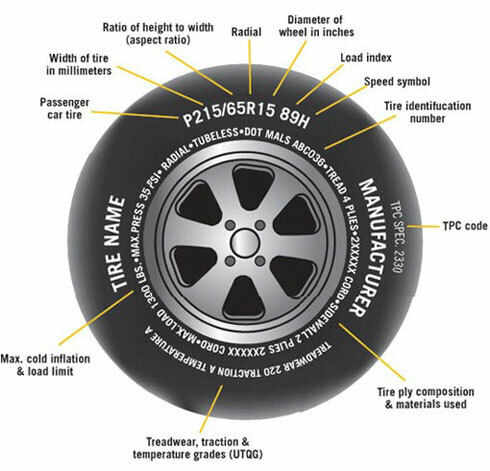 There are quite a few letters and numbers on each tire but I will only detail the ones that affect the overall tire diameter. I will use the P215/65R15 tire shown in the image as a reference. The first number is pretty straight forward and indicates the tire width (i.e., the part in contact with the road) in millimetres (yes, tire sizing is a nice mix of metric and imperial!). In this case the tire is 215mm wide. The second number refers to the aspect ratio of the tire (sometimes called the Profile of the tire). In this case the height of the sidewall 60% of the tire width (215mm x .6 = 169mm). And finally the third number is the one we are all mostly familiar with, this refers to the diameter (in inches) of the rim the tire gets mounted to. In this case the tire is designed to be mounted on a 15″ rim. The first step is to convert all of the values to the same format. In our example we convert the tread width from millimetres to inches (215/25.4=8.46 inches). Now we calculate the sidewall height (8.46 x 60% = 5.08”). Now if I am short by 4” on a row using 215/60R15 tires (25.16”) I can swap out 3 tires for 215/70R15 (26.85”). Of course given the different level of wear on each tire this is not perfect but it certainly helps when digging through the tire pile! 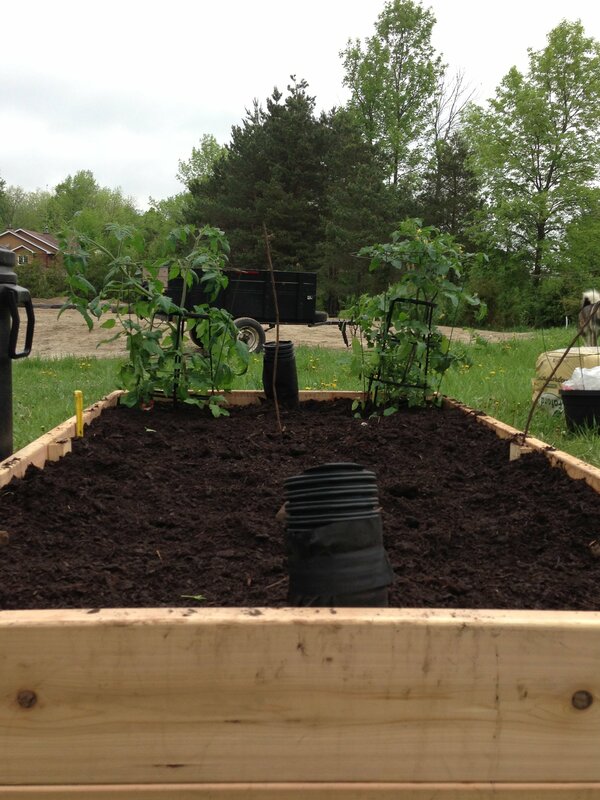 Growing some of our own food is a major component of our goal to become as self-sufficient as possible; however, since I’m not an accomplished gardener and my thumbs are kind of a brownish shade of green, I know that I am going to be doing a lot of learning and experimenting along the way! 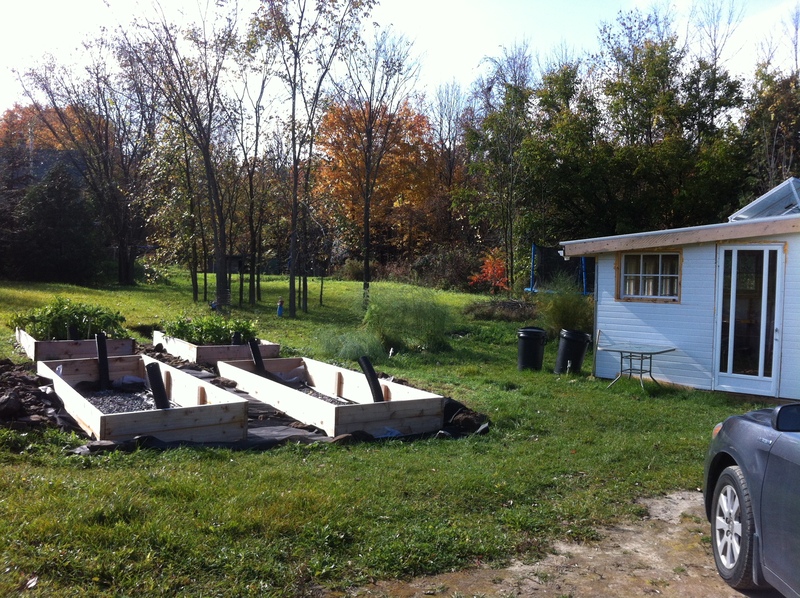 My first attempt at a vegetable garden on our Earthship lot was made two years ago when I dug up a small plot of grass, removed the sod, turned the soil and planted a half-dozen or so types of vegetable seeds. 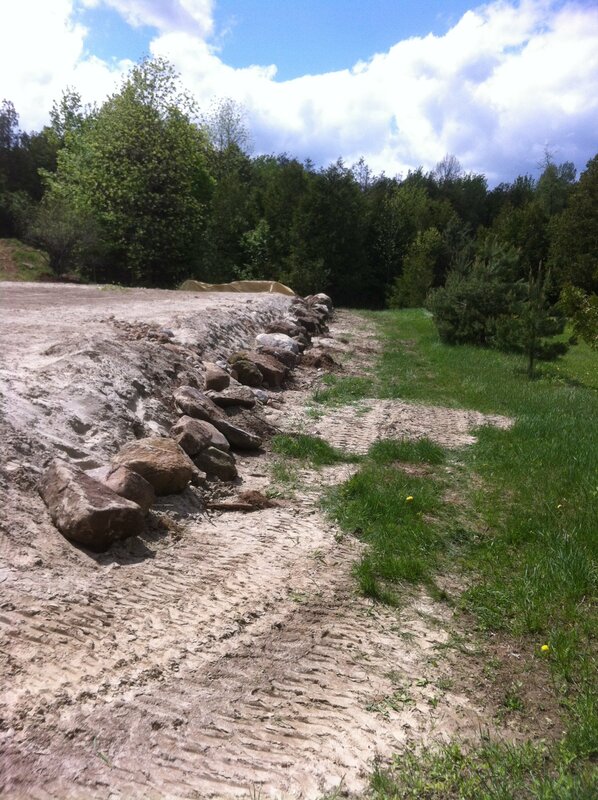 The native soil on the land is a rocky silty fine-sand mixture which is very well drained but not nutrient rich. Plants grew in my garden that summer and a few were even vegetables! Albeit of small size and mediocre quality. That was before we had a building permit so at that point we were only on the property on weekends and occasionally for somewhat longer stretches during summer holidays. 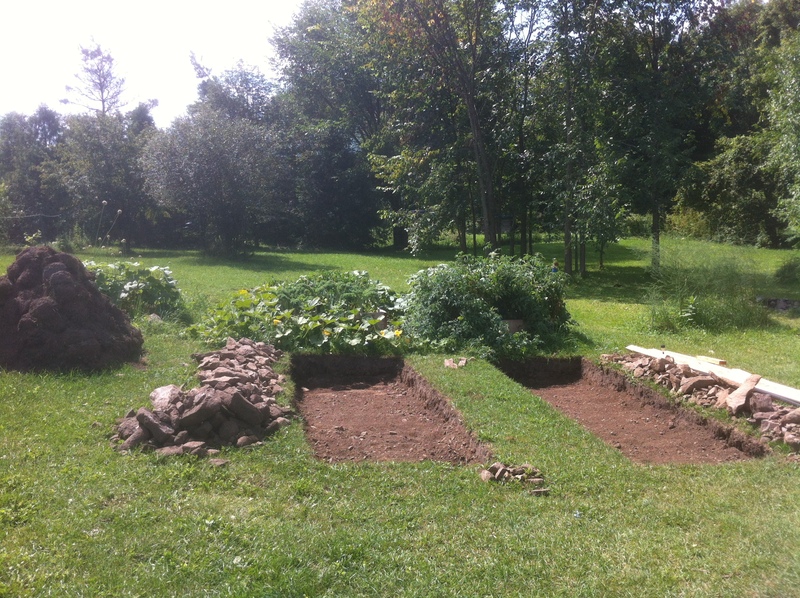 Without regular watering, weed control and attention, my first attempt at a vegetable garden was a bit of a joke! This year I’m trying again! 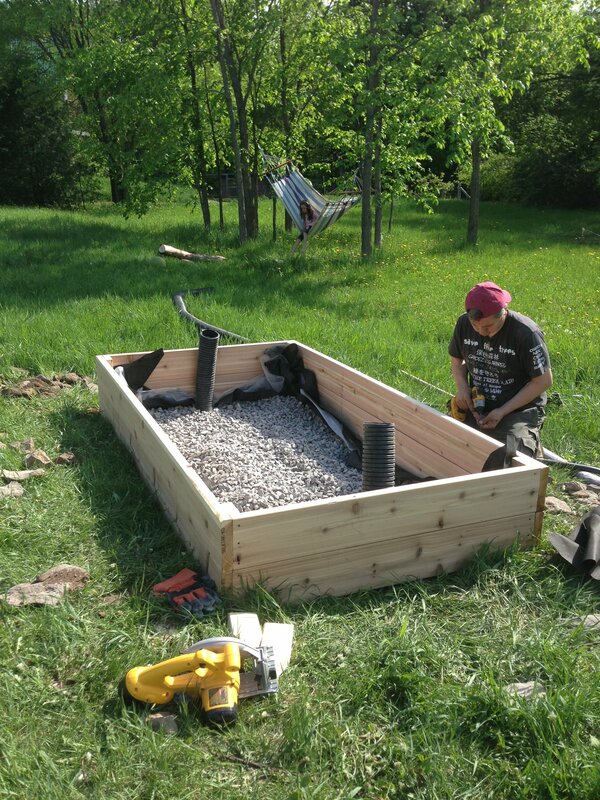 I’ve been doing some research on how to compensate for poor soil quality, limited watering ability and an overzealous local weed population and I decided to try my hand at building raised wicking beds. 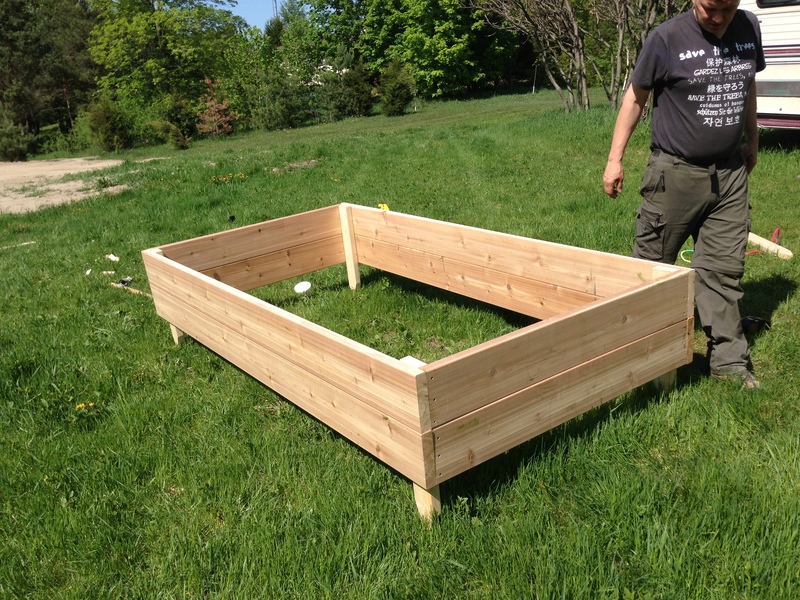 These raised garden boxes are built upon the existing soil and filled with high quality garden soil and compost mixtures that are perfect for growing vegetables. 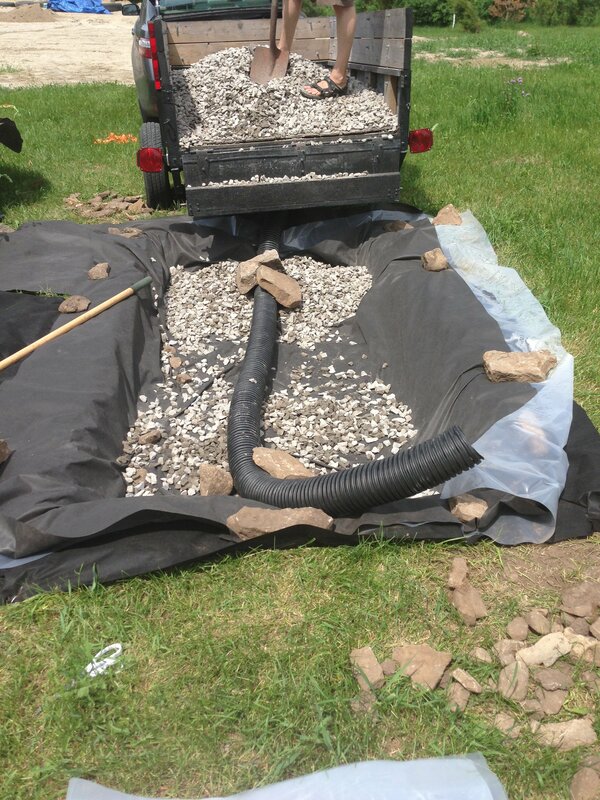 Beneath the soil in the boxes, a well is dug out, lined with plastic and filled with gravel. 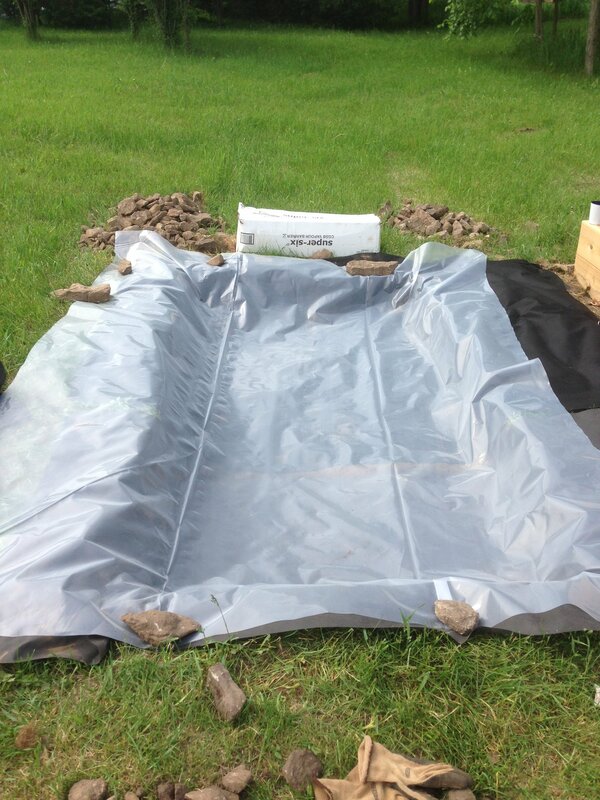 This well, when filled with rain or hose water, acts as a reservoir beneath the garden. 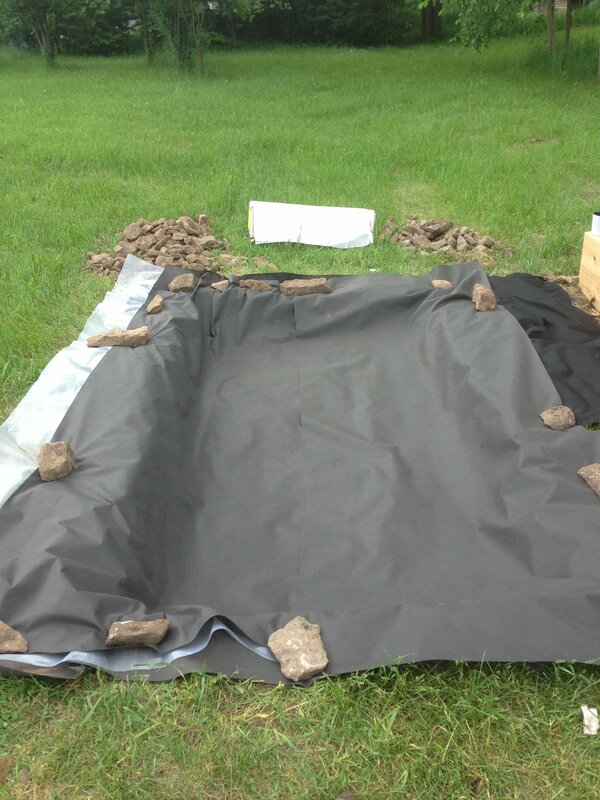 The soil and the plants are able to wick water up into the growing zone where it becomes available to the plants. 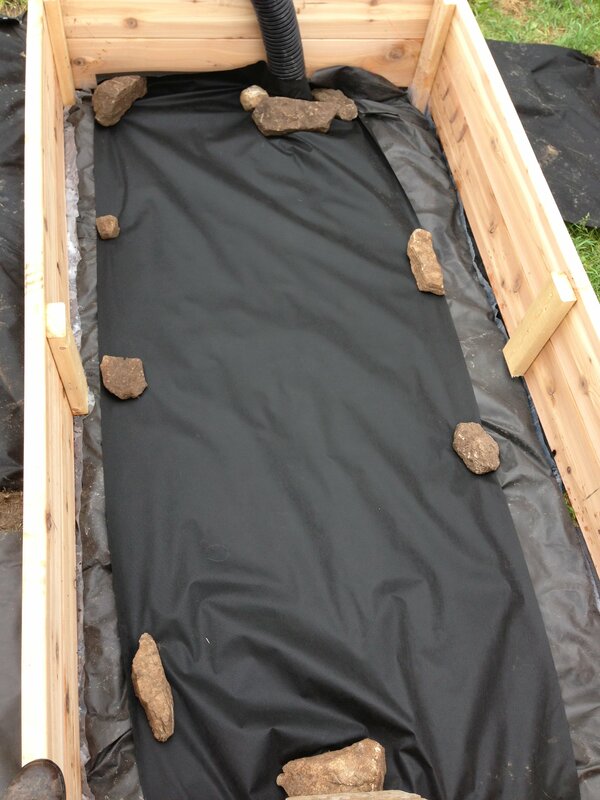 Even during very dry periods, the wells can hold enough water to keep the vegetables in water for at least a week. 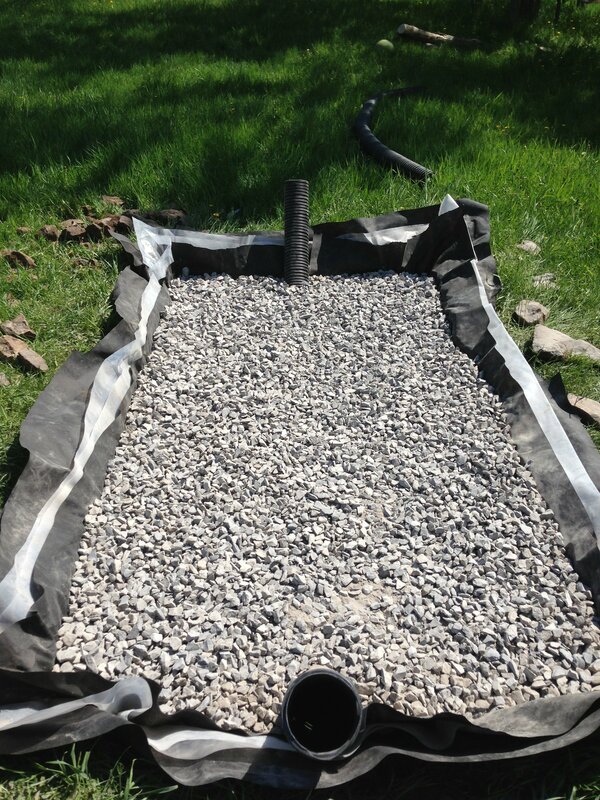 This, combined with the high organic content of the soil in the bed and a mulch application on the garden surface, should allow my gardens to thrive with minimal water addition, even when I’m not on-site and able to water on a daily basis. 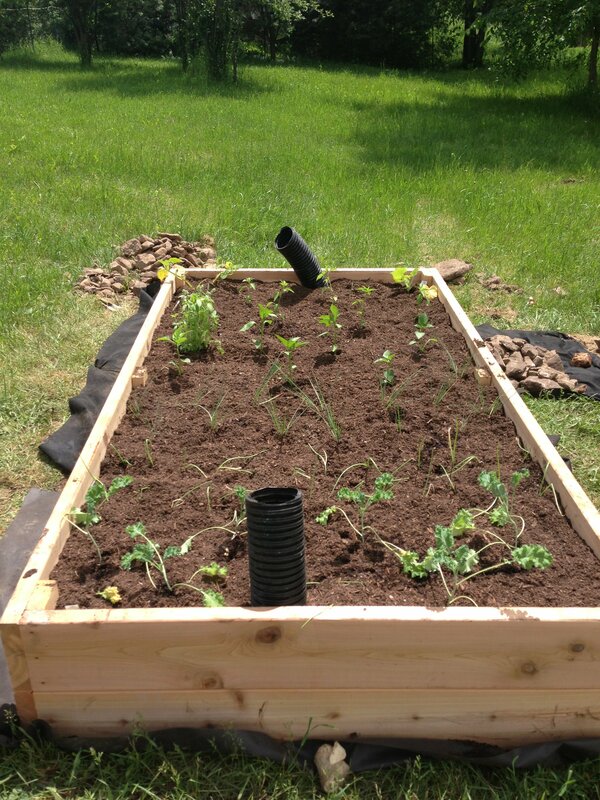 Since we don’t plan to dig a well on the property and use only the water we can catch from the sky, having a highly water efficient food growing system in place is definitely in our interest. 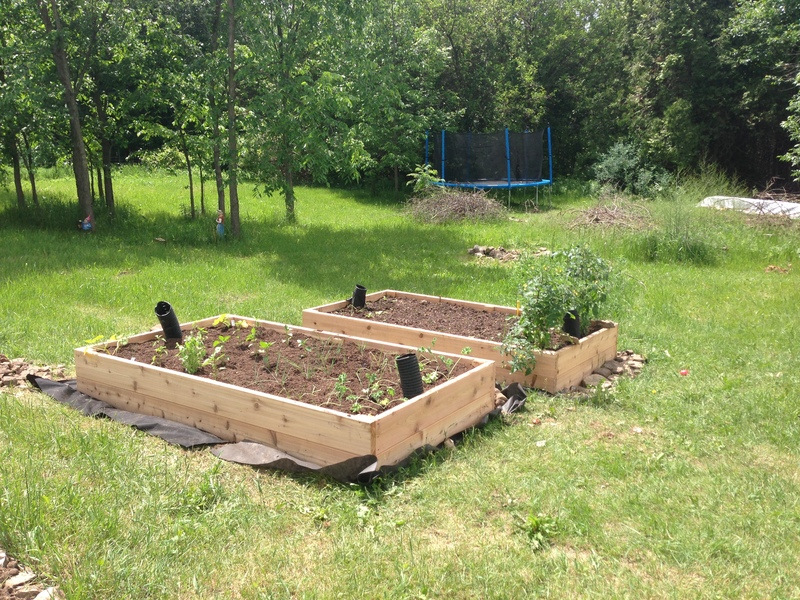 I’m very curious how these gardens will do this year and will post updates throughout the summer on interesting developments! 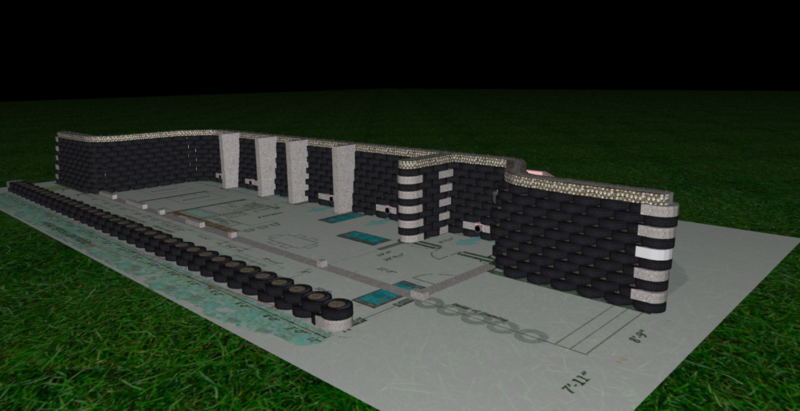 Here are the latest renderings of my Virtual Earthship. 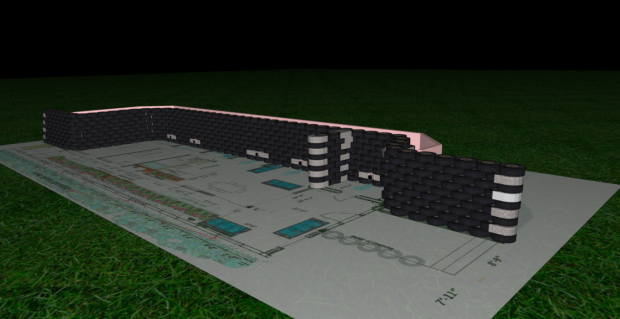 For those of you seeing this series of posts for the first time, I am building an Earthship virtually to get a better understanding of the process before I start the actual work on the construction site. 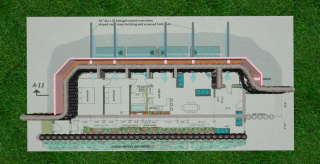 I am hoping that people reading these posts with previous Earthship building experience may point out some errors or offer suggestions. 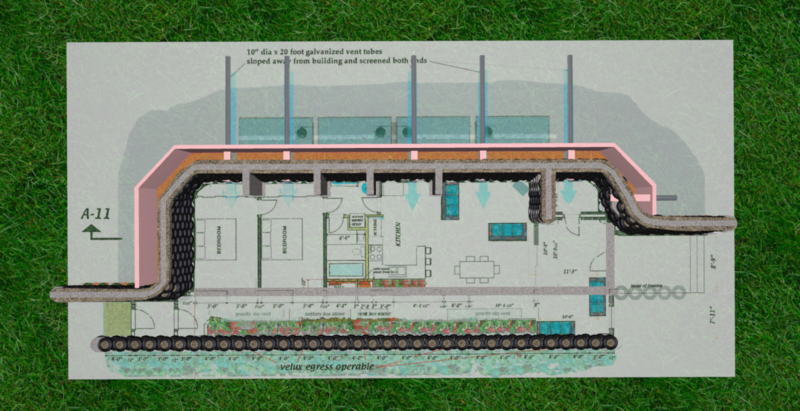 In this series of renderings I have added all of the concrete work and stem walls for the inside greenhouse walls. I have modified the stem pours slightly to accommodate a larger opening off the kitchen and living room areas. Our hope is to install partition window walls that can be removed in the warmer months to open the house directly into the greenhouse. The stem pour positions line up with vertical beam positions that will support the transfer beam. I am getting this reviewed by a structural engineer to be sure we will not have any issues. In this series I have also added the rear buttresses. 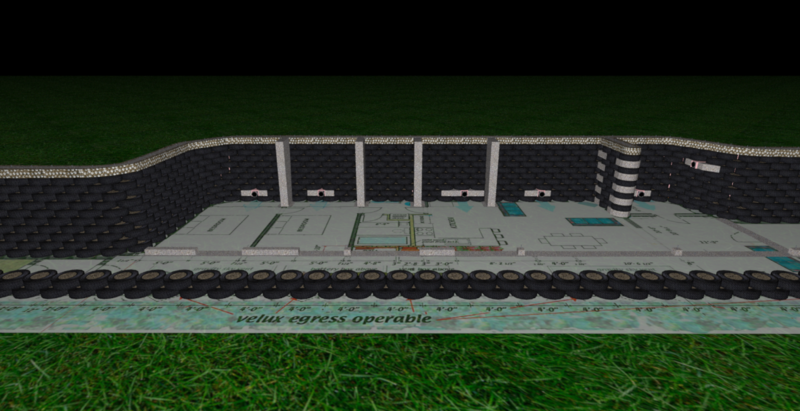 Although it can not be seen, I also virtually built the rebar support structures. I found the details of this portion a bit vague on our drawing. I plan to bring this up during one of our telephone consultations with Earthship Biotecture but if anyone out there has poured these buttresses and can explain the rebar pattern I would appreciate any information you might have. 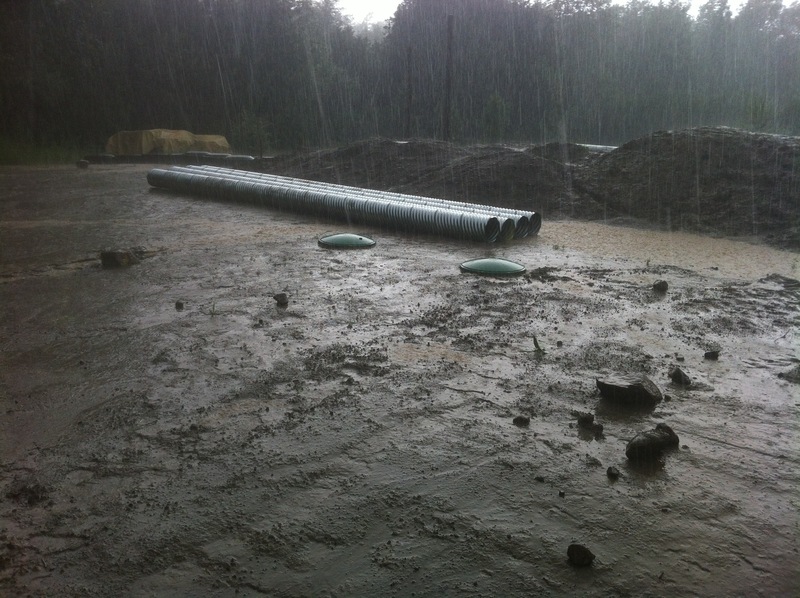 Welcome to our Earthship blog! After a 5 year journey we are finally on our way. We will be updating this blog frequently once we get started again in May. To the left you will see an image of an Earthship that was built in Brighton, England. This is not our exact model but we hope ours will look like this one day! 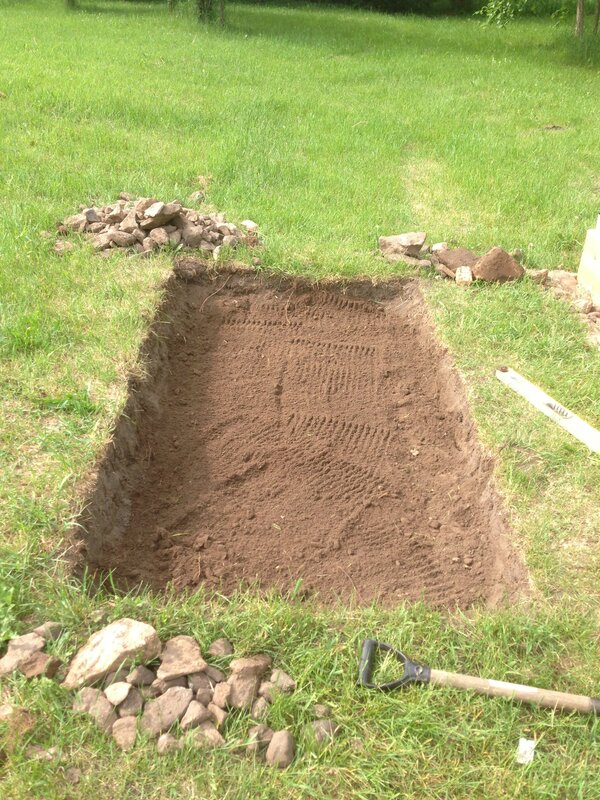 Be sure to check in and follow our progress. We are always open to ideas or suggestions! Please use the comments section at the bottom of any post or the Contact Us form.